Sprint announced this morning from BlackBerry Live in Orlando, Fla. that it will be launching the BlackBerry Q10 this summer. The Now Network did not announce a price for the handset as of yet, but you can sign up at its site for notifications for when the handset is available. The Q10 will support Sprint's fledgling LTE network, so if you have access to the 4G speeds, and the need for a physical QWERTY keyboard, this may indeed be the phone for you. ORLANDO, Fla. & OVERLAND PARK, Kan. – May 14, 2013 – Sprint (NYSE: S) today announced the summer availability of its first 4G LTE BlackBerry® smartphone, BlackBerry® Q10. Combining BlackBerry's best physical keyboard and a touchscreen with the power of the BlackBerry® 10 platform, this dynamic smartphone will benefit from access to the Sprint 4G LTE network and the power to access Truly Unlimited℠ data, text and calling to any mobile with no metering, no throttling, and no overages, all while on the Sprint network. Additional details, including pricing and availability, will be shared closer to the availability date. Customers interested in more information about the BlackBerry Q10 smartphone from Sprint can register for updates starting today at www.sprint.com/blackberry10. Also this summer, Sprint will begin offering enterprise and government customers BlackBerry Enterprise Service 10 version 10.1. This latest update to BlackBerry's multiplatform Enterprise Mobility Management (EMM) solution provides device and application management for Bring Your Own Device programs and corporate-owned BlackBerry, iOS® and Android™ devices. "We know our customers are anxious to get their hands on the new the BlackBerry Q10 smartphone," said David Owens, Sprint vice president-Product Development. "The physical keyboard on this smartphone makes it incredibly easy to send emails or texts on the go. Our plans for the BlackBerry Q10 smartphone will make it easy to be productive at work and stay connected with friends and family without fear of overage charges or throttling. We are excited to welcome this new BlackBerry into our portfolio this summer along with the security offered by BlackBerry Enterprise Service 10 for enterprise customers." Built with precision and offering premium performance in a signature design, the BlackBerry Q10 smartphone combines BlackBerry's best physical keyboard and a touchscreen with the power of the BlackBerry 10 platform to help you communicate and collaborate faster and more efficiently. 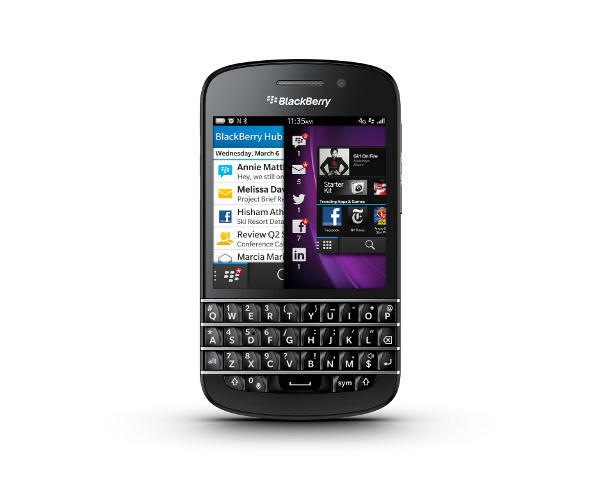 BlackBerry Q10 includes advanced hardware, communications and multimedia features. Its long battery life lets you confidently stay ahead and take action all day long. BlackBerry Q10 features a 1.5GHz dual-core processor, 2GB RAM, 16GB memory and microSD memory card slot that supports up to 32GB memory cards. It also offers a 3.1-inch Super AMOLED touchscreen display with capacitive multitouch navigation and four-row, full QWERTY keyboard making it easy to use. Continuing the BlackBerry tradition of long battery life, BlackBerry Q10 boasts a removable 2,100mAh lithium-ion battery. It also offers an 8-megapixel main camera with 1080p HD video recording and 2-megapixel 720p HD front-facing camera. The ever-present BlackBerry® Hub, which brings all your conversations together in one easy-to-manage place that you can access at any time from any app with a simple "peek," so you're always only one swipe away from what matters to you. BlackBerry® Balance™ technology, which protects what's important to you and the business for whom you work. BBM™ (BlackBerry® Messenger), which lets you share things with the people who matter to you in an instant. BBM in BlackBerry 10 includes voice calling and video chat and lets you share your screen with another BlackBerry 10 contact. BlackBerry® Remember, which helps you tackle tasks quickly with a new way to collect, organize and act on all the information sitting in different places across your smartphone. Sprint customers are discovering Sprint 4G LTE in cities that have not yet officially launched, including Washington, D.C., New York and San Francisco. Sprint has announced more than 170 markets where LTE will be available in the coming months. Sprint expects customers to benefit with better wireless signal strength, in-building coverage and fewer drops/blocks. In addition, Sprint smartphone customers also benefit from Truly Unlimited data, text and calling to any mobile with no metering, no throttling, and no overages, all while on the Sprint network. For the most up-to-date information on Sprint's 4G LTE coverage, please visit www.sprint.com/coverage.